They say it's hard to walk in another's footsteps, but those were exactly the instructions we received when trekking along the ridge of an approximately 350-foot-high sand dune in Namibia, Africa. The old mountain-climbing adage applies here, as well: "The slower you go up the mountain, the faster you get there." 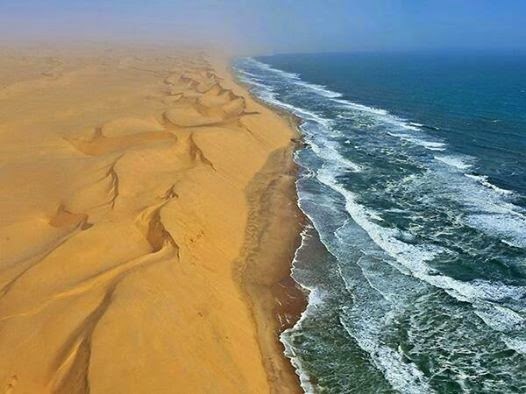 The country is located on the southwest coast of Africa and is named after The Namib, a 1200-mile-long stretch of real estate where scorching desert in stunning contrast overlaps frigid sea, and water, wind, sand and sun play off each other to create a unique visual landscape that challenges the most versatile of photographers. The desert, home to the highest sand dunes in the world, parallels the Skeleton Coast, so named in honor of the many wrecked ships and sailors’ lives lost over centuries. The latter also is home to hundreds of thousands of seals but despite their close proximity, rarely do the seals climb the dunes. Our sunrise ascent of the dunes, rust in color, smooth in texture, mountainous in size, and other-worldly in nature, was part of many such excursions on our Overseas Adventure Travel (OAT) tour, where the daily mantra of our guide, Bhavi, focused on “learning and discovery.” But more on that later. First, from the summit we watched the early sunlight dancing on the dunes to the tune of orange, pink, tan, yellow and gray-colored notes. Later, flying in a small plane above a wider panorama, the dunes more resembled frothy peaks of pink meringue covering the countryside, and the sensuous gradations, indentations and undulations created by the shadows playing off those soft swirls of desert icing added as much to this visual feast as has the sweet geology of time. My fellow travelers on the tour, all OAT veterans and intrepid adventurers, came to Namibia in part because it was virgin tourist territory. Mary Jo McDonald of Madison, Wisconsin touted the trip as "Exactly what I expected. It was full of adventure, exposure to under-developed areas with wildlife different from my other trips." And she added: "I came primarily to see the dunes and they didn’t disappoint. I loved climbing them at sunrise and seeing them in such terrific light." Our sunrise ascent of the dunes, rust in color, smooth in texture, mountainous in size and other-worldly in nature, was part of many such excursions on our Overseas Adventure Travel (OAT) tour, where the daily mantra of our guide, Bhavi, focused on “learning and discovery.” But more on that later. Labels: africa , country , desert , Namibia , sea.